Ivacy is a VPN provider that has been around for quite some time now. Pioneers of Split Tunneling, apparently, the VPN service provider has managed to stay relevant due to its offerings. Additionally, it manages to offer so much without charging exorbitantly. Let’s take a look at the affordable VPN service to determine whether it is worth the money or not. A closer investigation into the company revealed it is located in Singapore, which is not surprising, since most VPN providers are located in such regions to avoid having to given in to government agencies and their requests for confidential information, which would otherwise would have been impossible to refuse. The company has been in the industry for almost a decade now, and it has done well for itself. It has garnered the much needed experience to reach new heights, which it most certainly has. How does Ivacy VPN Works? Taking a closer look at Ivacy and how it works, it is really not that complicated. Basically, the VPN provider offers a myriad of applications for different platforms, like Windows, Mac, iOS, Android and Linux. The app can be installed before or after subscribing to the service, after which a user can choose to a specific server, or let the application connect to the fastest available VPN server automatically. Smart Connect – For specific use cases and greater customization. Secure Download – For security and anonymity while downloading content and files. Unblocking – To access geo-restricted sites and content. Streaming – For greater bandwidth, and also to overcome ISP throttling while streaming. Dedicated IP – To access private networks that would otherwise not be available using just about any IP address. Once connected to a VPN server, users will get a new IP address, while their own will remain hidden. This way they can remain secure and anonymous through and through. In fact, not even ISPs can access a VPN user’s internet traffic. As for what the subscription entails – users get access to 450+ servers in 100+ locations. Unlimited Server Switching allows users to switch between as many available servers as they like. For every VPN server that is used, users also get to benefit from Advanced Data Encryption Protocols. Why Should Users Opt for Ivacy VPN? Users looking for a complete solution to meet their needs and requirements in regards to online security and anonymity will love Ivacy VPN and all of its offerings. Also, it will meet and exceed expectations for those that just want to stream and download their favorite content, while benefitting from being anonymous while doing so. One of the best things about the VPN provider is the fact that they guarantee that no logs are kept on any of their users. According to Ivacy, its users can rest easy knowing they are protected on all fronts, since the VPN provider does not keep any logs at all. Moreover, Ivacy VPN has a dedicated customer support team, which is available 24/7 via email or live chat. 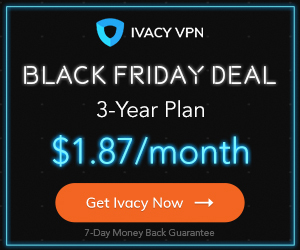 Taking the aforementioned factors into account as well, it should really be a no-brainer to get an Ivacy VPN subscription, as it has plenty to offer without being all that expensive. Just like any other product or service, Ivacy VPN too has it pros and cons. Greater customization for those that want a tailored experience. Refunds can take time depending on the payment option availed initially. Ivacy’s terms and conditions are quite clear about what information is collected, and how it is used. Information like an email address and payment information is required by Ivacy to create an account, and for communications in the future. However, if a user wishes to opt out, and wants to have his/her information deleted for good, they can easily do so. Although, once removed permanently, they will not be able to use Ivacy again. Thankfully, the VPN provider also is quite transparent about its refund policy and terms of usage. It is evident that any and all users opting for Ivacy will be in safe hands, through and through. Ivacy is the perfect VPN for any and all that value their online freedom and anonymity, without giving out too much of their own information to Ivacy. Since the subscription does not cost too much, it is a must-have, especially considering how many features the service provider is offering in the first place. Simply put, Ivacy is a steal for online freedom, security and anonymity without question. Want to buy this service? click here to buy now. Ivacy VPN Review: A closer investigation into the company revealed it is located in Singapore, which is not surprising, since most VPN providers are located in such regions to avoid having to given in to government agencies and their requests for confidential information, which would otherwise would have been impossible to refuse. Tags:Ivacy VPNIvacy VPN ReviewIvacy VPN Service Full ReviewWhy Should Users Opt for Ivacy?